HOUSTON (AP) Frankie Montas had a tough time in the first inning of his last two starts, giving up seven hits and five runs combined. So when Oakland’s starter threw a perfect first against the defending World Series champion Houston Astros on Monday night, it was just the confidence boost he needed to get back on track and turn in a strong start. 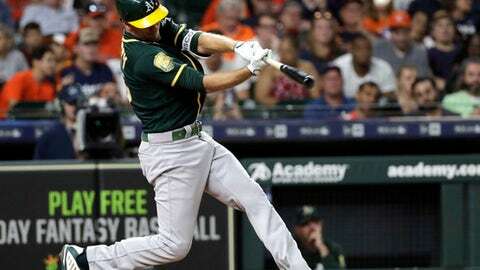 Montas and two relievers combined for a five-hitter, Stephen Piscotty homered and hit an RBI single and the Athletics beat the Astros 2-0. It took the 25-year-old Montas just eight pitches to retire All-Stars George Springer, Alex Bregman and Jose Altuve in the first. Houston starter Gerrit Cole struck out 11 and scattered three singles across six scoreless innings before Brad Peacock (1-4) took over for the seventh. Piscotty, who finished with three of Oakland’s six hits, greeted him with his home run to left field to make it 1-0. Piscotty added an insurance run with a single in the eighth. The Athletics have won three in a row and 11 of their last 13. The loss snapped Houston’s six-game winning streak. Montas (5-2) also allowed just three singles with two walks and two strikeouts in six innings after yielding 17 hits and nine runs combined in his last two starts. Lou Trivino struck out three in two perfect innings before closer Blake Treinen allowed two singles in the ninth, striking out Evan Gattis for his 23rd save to help Oakland improve to 35-0 this season when leading after seven innings. It’s the 20th straight save opportunity he’s converted dating to May 4. Marwin Gonzalez walked with two outs in the second inning, but Houston didn’t get a hit until a single by Altuve with one out in the fourth. But he was soon erased when he took second and tried to reach third on a wild pitch, and Montas struck out Josh Reddick to end the inning. Houston had just one hit in the sixth inning before Springer and Bregman hit consecutive singles. Montas was able to escape the jam when Altuve grounded into a double play. Cole retired the first eight batters before Jonathan Lucroy’s single with two outs in the third inning. Cole walked Jed Lowrie with two outs in the sixth before an infield single by Khris Davis. But he struck out Matt Olson to end the threat. Astros: SS Carlos Correa (back stiffness) took ground balls on Monday in a small step toward his return to the field. But manager A.J. Hinch said it’s still too soon to tell if he’ll come off the disabled list before the All-Star break. Both Melvin and Hinch believe that A’s second baseman Lowrie deserved a spot on the All-Star team, which was announced on Sunday. Lowrie leads all American League second basemen with 16 homers and his 62 RBIs are tied for second among all players in the AL. Houston’s Justin Verlander (9-4, 2.15 ERA) opposes Oakland lefty Sean Manaea (8-6, 3.33) when this four-game series continues on Tuesday. Verlander struck out 10 and allowed four hits and two runs in seven innings but did not factor in the decision in a 4-3 win over the White Sox in his last start. Manaea has a three-game winning streak, but did not factor in the decision in his last start.